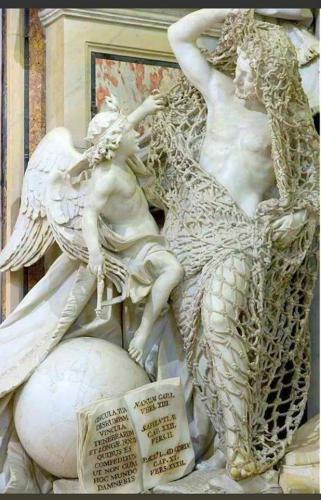 "Release from Deception" - Statue carved out of a single piece of marble, including the net. Release from Deception (Il Disinganno), produced in 1752-1759, shows a fisherman being released from a net by an angel. The masterpiece was carved from a single piece of marble and can be seen in Cappella Sansevero, Naples. The ambitious project was considered by some to be impossible to complete, and only Francesco agreed to attempt it.